Back to School – technologies are boom or bust? As an instructor and adjunct professor since 1982 at several universities, I’ve been fascinated with the wonderful creation and infusion of technology into the classroom. I cannot tell you how helpful it is to have a computer to create a proposal or presentation – where I can actually go back and easily correct or amend a paper … or to have this vast amount of data at my fingertips along with the capability to archive my work effortlessly (and logically!). And of course, now that we have e-mail (yes, young ones, we didn’t always have e-mail or the world wide web), I can easily communicate with students, from whenever I am – whether it’s teaching a class online via Blackboard from Dubai or Bangkok (have done) or just staying in touch with students once they graduate. It’s nearly September now, and I remember how excited I was when I was a young lad growing up in Pasadena and getting my first fountain pen and picking out my favorite note book, paper and tabs for my first day at school. “Back to School” then was an adventure I looked forward to each year – because I would make new friends and get new stuff. Technology has truly entrenched itself in the classroom … but is it always for the ‘good’ of learning? One of my friends from Northwestern, Dr. Martin Brock, told me the story of when their new Medill School of Journalism and Integrated Marketing Communications opened … and each classroom had the latest wireless presentation technology. He was so pleased to see that the students all had their laptops opened and were briskly taking notes of his lecture. He thought this was marvelous … until he walked to the back of the room – while lecturing – and noticed on his way back to the lectern that they were, indeed, not taking notes – but either playing computer games or solitaire. “Ha,” he thought … so much for my brilliant lecture. You like google.com? Well, students love it. 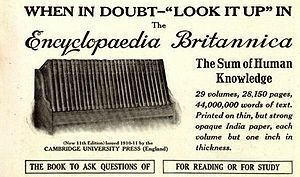 As a student who never had a complete set of Encyclopedia Britannica while in school, fear not! Students do – and mo’better. You can find anything you want on Google – a term paper, a case study, a complete marketing plan – you name it, it’s there. And research? One of the first things students do these days is learn how to C&P – cut and paste. Of course, we lecture students about C&P – it’s a no-no … with some exceptions (like product lists and photos, charts, graphs) … but I will find students C&P whole sections of their projects and claim it as ‘their own’. You can easily detect C&P work when students fail to delete the “we” from company descriptions, mission statements or marketing plans … dead give-away for C&P. Of course, we encourage students to be original – to actually learn how to think. The elimination of the slide rule and introduction of the handheld computer was a major leap for technology … and the computer and access to the WWW mean students have no excuse for not delivering superior work (and thought). I’m still impressed with the quality of student work today, even with all this “help”. At the graduate level I see many students who have learned to use all the technology and data available to them in superior ways I never thought possible years ago. The writing – when original – can be stimulating and page-turning. The addition of graphics and sensitive, eye-catching presentations on the page, makes their reports not only relevant but a pleasure to read. Yes, I miss the fountain pen – the first hand-held computer? I still have them – a couple of Monte Blanc, Dunhill, Parker, and Schaefer pens– right in front of me. I still love the feel of putting ink on paper with the movement of my own pen and hand. It’s quite a marvelous experience, really. You ought to try it some time. It can be downright inspirational and perhaps take you back to some very good times. Back to School is special times to students of any age, and it is especially wonderful for our young children going to school for the first time – at any grade. Especially us old ones! Have fun in school.